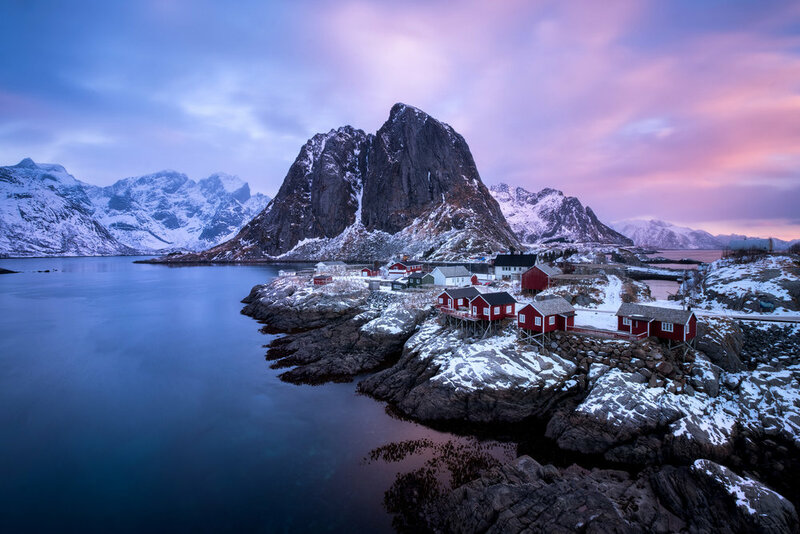 An archipelago of islands scattered between icy fjords and ocean beaches, punctuated by snow covered mountains and fishing villages, Lofoten in winter is a truly magical place. In February the islands are blanketed with fresh snow and breath-taking views are everywhere you look. 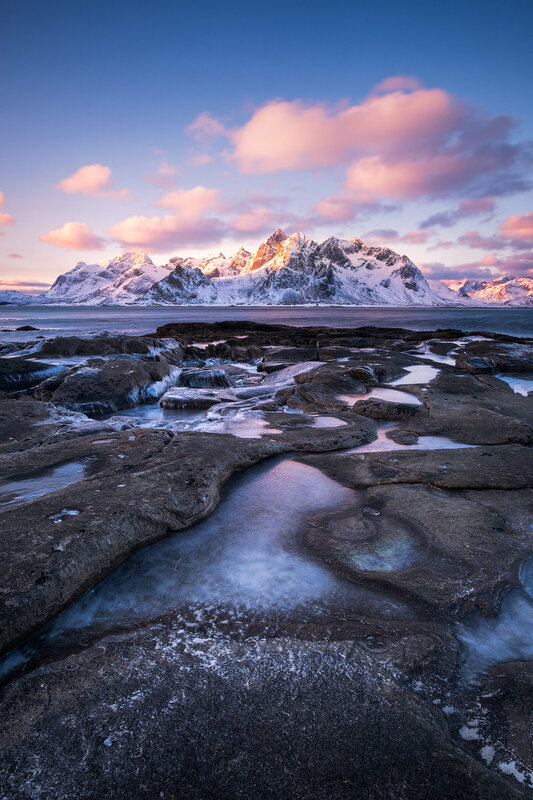 With the low arctic sun giving fantastic light for almost the whole day, as well as unusually long sunrises and sunsets, Lofoten really is a photographer’s paradise. The geography of the islands with coastline on both the north and south sides and long fjords that separate the different islands give us so many different angles and locations to shoot at different times of day, and wherever we are there’s always the backdrop of dramatic snowy peaks as a focus for the images. We base our workshop at the iconic red cabins on the island of Hamnøy with each participant having their own private room. From here we explore the area taking in the most iconic views; the village of Reine surrounded by fjords and mountains, the rocky beach at Uttakleiv and the wind-blasted beach of Skagsanden. 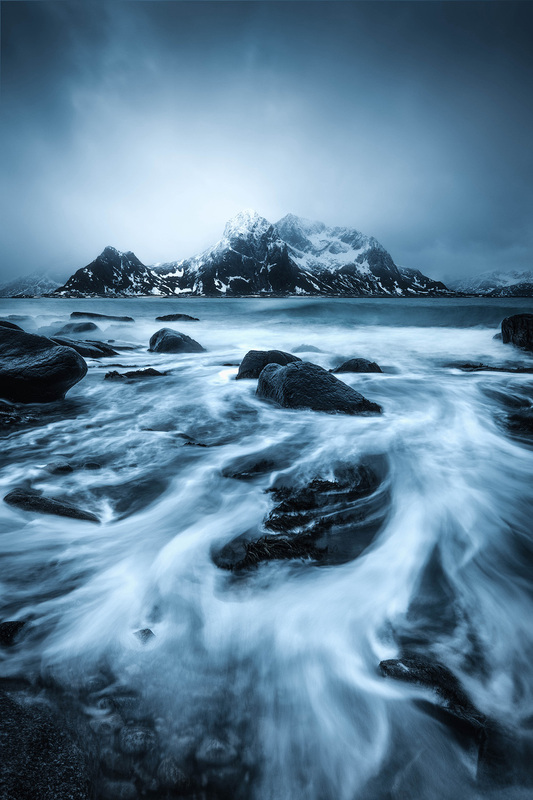 We’ll photograph the mountain views across the nearby fjords at Vareid, Ramburg and Flakstad, as well as reacting to the weather to find interesting compositions. 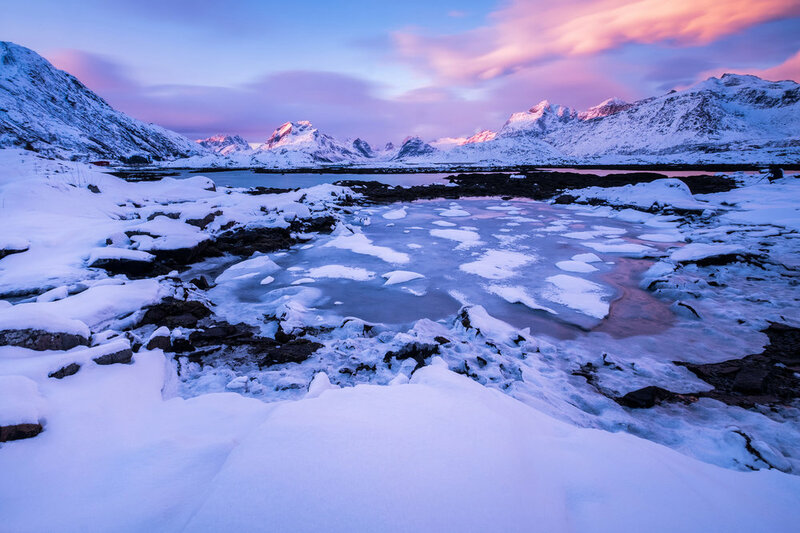 For example, after a fresh snowfall every location is subtly changed; frozen tide lines form at the edge of the sea and the twisted ice formations in the frozen parts of the fjords reveal streams of blue water that contrast with bright white snow. Not forgetting of course that the cabins we’ll be staying in make a fantastic subject for photos across the water with jagged granite peaks behind, and just a short walk from our accommodation provides constantly changing views of the Reinefjord surrounded by mountains. Finally, at this latitude and time of year we have an excellent chance of seeing the beautiful aurora, a sight that you really have to experience to truly appreciate it’s beauty. While it’s impossible to guarantee we’ll definitely see it, we can promise that if it does appear we’ll wake you up, and our central location means we can be at any number of perfect vantage points to shoot it incredibly quickly. Even if we’re not blessed with an appearance of the northern lights, shooting the night sky in Lofoten is a treat due to it’s low levels of light pollution. All our workshops are designed to ensure that you can focus on photography while we take care of everything else. Airport transfers, ideally located and comfortable accommodation as well as all dinners are all part of the package, and of course the tour is structured to maximize your opportunities to get great images whilst improving your skills as a photographer. We use all our experience and knowledge to get you to some of Lofoten’s most beautiful locations in the best light, and in the field we’re on hand to provide as much support, advice or guidance as you want. Having two professional photography guides helps us to ensure that each participant gets plenty of one-to-one tuition and allows us to better tailor each session to your needs. Because of this we can accept a range of experience levels from beginners to professionals and comfortably cater to each. Beginner, amateur, enthusiast and semi-pro photographers. Almost all of the locations are accessible by car. All accommodation in your own room in a cabin shared with one other person. This is a standard overview but it’s flexible and which day we visit each particular location will be decided depending on the weather and conditions. We will however ensure that we visit all of the locations listed below. At this time of year sunrise is around 8h15 and sunset around 16h30 with long periods of golden and blue hour during which we can shoot. 18h30 We’ll pick you up at Leknes Airport and transfer to our cabins in Hamnøy. 19h30 onwards We’ll check into our cabins before having a welcome meal in a nearby restaurant. 7h30 – 9h Sunrise shoot in Hamnøy. Right outside of our accommodation we have the iconic view of the cabins we’re staying in below the peaks of the Reinefjord. Afterwards we’ll walk through the different islands like Sakrisøy and capture some views of the different cabins. There are so many opportunities for photography depending on what the weather and conditions are like, so we’ll use our local knowledge of the area to get you to some fantastic locations. 13h We’ll have lunch at Anitas Sjomat, Sakrisøy’s famous fish restaurant. 14h30 - 17h30 By now the sun will be quite low in the sky offering great light wherever you look so we’ll head out again to find a place to shoot sunset. Depending on weather conditions we could head to the islands near Fredvang, the beach at Skagsanden, the lake at Storvatnet or anywhere else around the local fjords. 17h30 We’ll head back to our accommodation and then out for dinner in a local restaurant. Afterwards we can have a walk around Hamnøy and shoot the local area at night, and of course if there’s any sign of the aurora we’ll head out to find a great place from which to shoot it. 7h30 – 11h Sunrise shoot in Vareid. 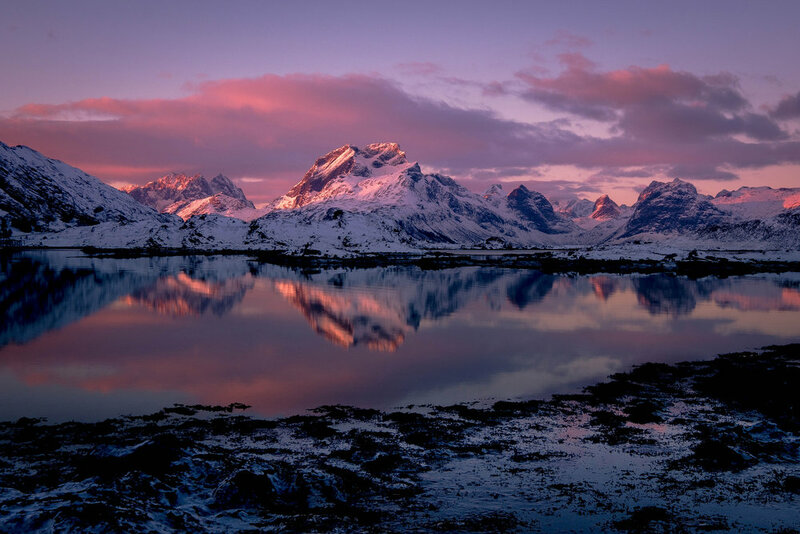 This stretch of coastline looks southwest towards the mountains above Flakstad and at dawn the snow capped peaks are illuminated by the rising sun. There are lots of different compositions to play with along the rocky coastline, and after the sun has risen we’ll head along the fjord to the south where there are some fantastic locations and views across the frozen Flakstadpollen. 11h30-13h After returning to Hamnøy we’ll get together for a post-processing session looking at getting the best from the images we’ve taken so far. Our post-processing sessions will be tailored to suit the differing levels and requirements of our clients and can range from Lightroom basics through to Photoshop Luminosity Masks and more advanced techniques. Afterwards we’ll break and have lunch. 14h30 After lunch we’ll head out to explore Lofoten again, stopping off at Nusfjord, a picturesque village of red cabins on stilts above the fjord and one of Norway’s oldest fishing communities. We’ll then make our way north around the Fjord to finish the day shooting at Skagsanden. 18h30 We’ll get back to our cabins and head out for dinner together, after which people are again free to do some night shooting in the local area. 7h30 – 9h Sunrise shoot on the islands in the fjord near Fredvang. The views south across the water here are wonderful, and once again as the sun comes up it paints the white peaks at the top of the surrounding mountains a beautiful warm colour. Afterwards we’ll head over to find some compositions in the frozen streams between Fredvang and the beach of Ytresand beach in the morning light and then, depending on what the weather and conditions are like we’ll head to some of our favourite locations like the beach at Ramburg or the church at Flakstad. 13h Back to our cabins for lunch and to relax for a short break. 14h30 - 17h30 We’ll head out to the island of Vestvågøya. Between the beaches Haukland, Unstad, Uttakleiv, and the Tangstad area there’s so much potential here to find a fantastic spot for sunset. 19h We’ll get back to our cabins and head out for dinner together, after which people are again free to do some night shooting in the local area. As on every night, we’ll be alert to the aurora forecast and make sure we’re in a great place to shoot it if it appears. 7h30 – 9h Sunrise at a nearby location. As usual, depending on the weather and on how previous shoots have gone, we’ll find a location from which to capture the day’s first light on this beautiful snowy landscape. 11h30-13h After getting back to Hamnøy we’ll get together for a post-processing session and look at getting the best from the images we’ve taken so far on the trip. After this there’s an hour or so break around lunch. 14h30 This evening we’ll make the most of our local surroundings in Hamnøy, Sakrisøy and Reine. The last light of day illuminates the granite walls of the peaks above the Reinefjord, so we’ll find a great place to shoot the sunset, and then in the blue hour head to the lookout over Reine to capture a wide panorama of the fjord with the lights from all of the houses on the various islands. 18h30 Dinner together in Hamnøy or Reine, and then depending on conditions perhaps some night shooting. 7h30 – 9h Once again we’ll head out for sunrise, and as on previous days we’ll decide on our location depending on the conditions at the moment and on whether it snowed the night before. 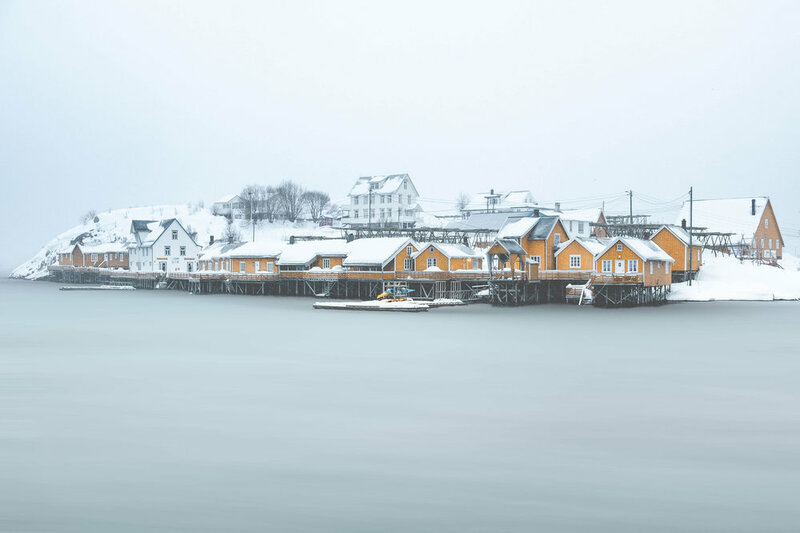 We could return to a location we’ve shot previously, or find a location that the snow and weather reveals to us, perhaps heading further afield to Stiene to see the incredible view across an archipelago of tiny snow covered islands. 14h30 - 17h30 As the sun dips lower in the sky we’ll head out for our final sunset. Weather and previous trips will define where we go, perhaps the wide open stretches and wind blown foregrounds of Skagsanden beach in Flakstad, or perhaps the view across the the peaks from the beach at Storsandnes. 17h30 We’ll head back to our accommodation followed by dinner in a local restaurant, and then cross our fingers for the aurora to appear. 7h30 – 9h We’ll just have time on our last morning to catch a final sunrise in Hamnøy, Sakrisøy or Reine before grabbing some breakfast, checking out and getting you back to the airport in Leknes. Our aim is to take you to beautiful locations and give you every opportunity to get great images while improving your technique over the course of the workshop. We believe that having two long shooting sessions a day means that participants get into a shooting rhythm and can quickly put into practice new skills as they are learned. Having such small groups allows us to spend a maximum amount of time with each participant and from the beginning of your time with us we’ll aim to identify your photographic level and what you’d like to focus on, and attempt to tailor the workshop to your precise needs and provide each participant with plenty of one-to-one tuition in the field. Our timetable is highly flexible and having a number of fantastic locations all very close to our base of accommodations means we can adapt to the weather and go where the conditions are best for shooting. This adaptability also extends to the post processing sessions. We believe that editing is an integral part of getting the absolute best out of an image but we understand that the range of participant’s skill levels and familiarity with post processing techniques varies greatly. Because of this we make the most of having small groups to provide 1-to-1 editing sessions in the morning that are tailored to each participant's skill levels, and which can potentially range from the basics of editing a RAW file in programs like Lightroom or Capture One to more complex techniques like using layers and luminosity masks in Photoshop. Finally, we want to share with you our passion for nature and landscape photography in this incredible place. We aim to make your experience here in the beautiful landscape of Lofoten a memorable one and a trip from which, as well as getting some great images from amazing locations, you’ll also go home having had a true adventure with great company in a very special place. Composition. Balance and harmony, leading lines and creating depth. For many of the locations a wide angle lens really is essential if you want to get those epic landscapes that have the icy rocks right up in the foreground leading to the snow capped mountains in the background. 16mm or 17mm on a full frame camera (10mm or 12mm on an APS-C sensor camera) is ideal, but anything below 24mm (16mm on a crop frame sensor) should be OK. You’ll also need a relatively fast widest aperture of f2.8 to allow lower ISO settings and shorter shutter times when shooting the aurora. In some of the locations we’ll visit a wide angle zoom will make the mountains appear smaller, so a mid-range zoom will be great for maintaining the scale of the peaks while still including foreground. They’re also great for panoramas. Something in the range of 24-70mm (18-55mm on a crop sensor) is perfect. Probably the least useful lens for this particular workshop as we’ll rarely be needing the compression or needing to pull the landscape closer, but nevertheless, there will certainly be times when it’s a useful lens to have in your bag, particularly if you enjoy shooting wildlife. We’ll often be shooting in low light and it can also get pretty windy, so a good tripod is an absolutely essential piece of equipment. This allows us to trip the camera shutter without touching the camera, which can cause movement blur during longer exposures. While we won’t be doing any long hikes we’ll certainly be doing some walking over uneven ground, and we’ll often find ourselves standing in the snow. It’s very easy for cold feet to completely ruin your day, so good boots with thick warm socks are vital. 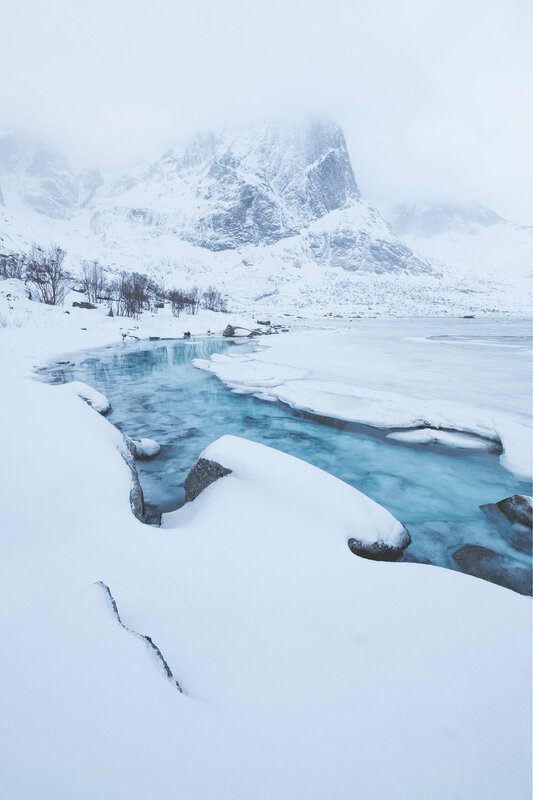 Lofoten is in the arctic circle, and while it’s generally warmer here than further inland in Norway, it still gets very cold and with the strong winds blowing you should be prepared for temperatures down to almost -20. Layers are the way to go with a base layer and mid layer and then a fleece on top. An insulated jacket on top of that and also a waterproof or windproof shell as a final layer to keep the worst of the weather out. Insulated long-johns/leggings below windproof hiking trousers to keep your bottom half warmer. It’s essential to keep your head and neck warm, so a good wooly hat below your hood really makes a difference, and a chute or neck-gaiter will protect your neck and the lower half of your face. It’s also easy for your hands to get cold so thick gloves with a pair of glove liners underneath for when you have to remove your gloves to operate your camera. If you’ve got them, mittens that open at the top so you don’t need to remove them are excellent. Finally, gaiters for the bottom of your trousers will keep the snow out of your boots if you find yourself in deep snow. When moving your camera gear for any length of time a backpack can really save your back. A good backpack, one with sturdy hip straps, can safely distribute the weight of your gear and really save you from aches, pains and potential injury. Bear in mind that you’ll often be putting it down in the snow as well so it should be water resistant. We’ll be shooting RAW, and as part of each day will be dedicated to post processing images a good RAW converter like Adobe Lightroom or Camera RAW is essential. Other converters like Capture One are also fine. Adobe Photoshop is great for more advanced processing as it allows us to be much more subtle and creative in it’s use of layers. If you have any questions about what to bring, don’t hesitate to contact us. ANDY MUMFORD is a Lisbon based professional landscape and travel photographer. Andy grew up in the UK loving nature and travel and took up landscape photography over a decade ago. Since then he has travelled extensively photographing all over the world and his photography and articles have featured in publications and books worldwide. He is a passionate photographer teacher and has been leading both group and one-to-one workshops for five years. He is a Fuji X Photographer and a brand ambassador for Fujifilm in Portugal, although he also has extensive experience with Nikon and Canon cameras. ANDREA LIVIERI is a Venice based professional photographer, educator, musician, and a spirited adventurer. He started exploring the photography medium by capturing images of fellow musicians, their families, and other friends and acquaintances in the music industry. 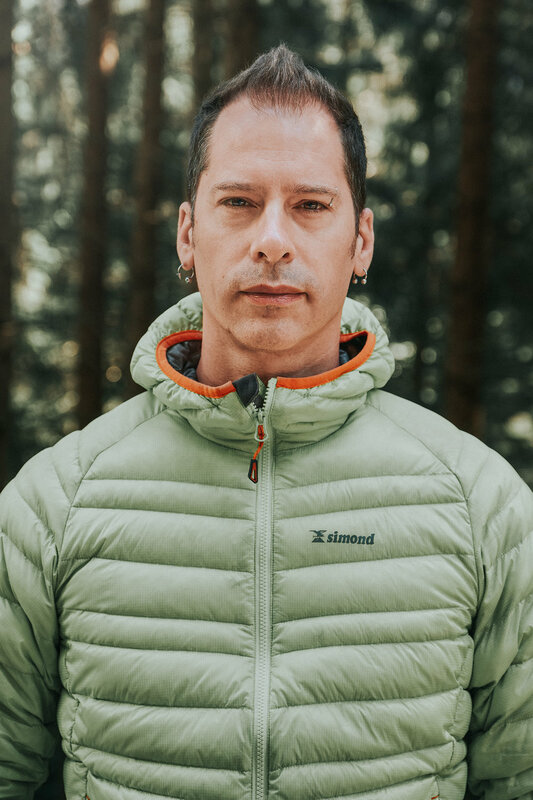 As he continued honing his craft, he merged his love for photography and exploring the outdoors, amassing a body of photographic work featuring exhilarating landscapes and rugged mountains capes from around the globe, He also leads photography courses, workshops & tours to teach other photographers his method and help them to bring out their own vision. His work has been published in Landscape Photography Magazine, Outdoor Photographer, Photo Plus Magazine, Digital Camera, Popular Photography and Fuji X Passion Magazine, among others. To register for the workshop we require a €900 deposit. Please complete the form below for more information.